MacDougal Street in Greenwich Village. Compitum viarum 4 Occidentalis et 12 Occidentalis. Signa viaria in compito viarum 10 Occidentalis et 4 Occidentalis. Gay Street in angulo Waverly Place. Cherry Lane Theatre in Greenwich Village situm est. Greenwich Village Halloween Parade, quotannis habitum, est maxima orbis terrarum pompa Pervigilii Omnium Sanctorum. Arcus Quadrati Washingtoniani, icon non officialis Greenwich Village atque Universitatis Novi Eboraci. Greenwich Village (Vicus Grenovicum), ab indigenis saepe Village (Vicus) appellatum, est vicinia in latere occidentali Manhata Inferioris Urbis Novi Eboraci sita. Vicus diu appellatur portus artificum, caput Bohemianorum, incunabulum motus LGBT hodierni, et locus natalis in Litore Orientali Aetatis Prostratae et contraculturae annorum 1960. Groenwijck (Districtus Viridis), unum e Nederlandicis vici nominibus, in Greenwich Anglice conversum est. Universitas Novi Eboraci et Nova Schola, duo ex optimis collegiis Neoeboracensibus, in Greenwich Village sita sunt. ↑ "NYPL Map Division, Greenwich Village". Nyplmaps.tumblr.com. January 25, 2014 . ↑ "Campus Map". New York University . ↑ "New York Campus". New York University . ↑ Biography, Edward Albee Society. ↑ Budin, Jeremiah. "Alec Baldwin Expands Devonshire House Empire with 1BR", Curbed Novi Eboraci, 5 Septembris 2013. ↑ Spokony, Sam. "Richard Barone is ‘cool’ with where he is right now", The Villager, 25 Octobris 2012. ↑ Hainey, Michael. "Nate Berkus and Jeremiah Brent Share Their New York City Apartment and Daughter Poppy’s Nursery; In Greenwich Village, star designers Nate Berkus and Jeremiah Brent—and their daughter, Poppy—settle in to family life in spirited style", Architectural Digest, 30 Septembris 2015. ↑ Marino, Vivian. "Sarah Jessica Parker’s House Sells for $18.25 Million", The New York Times, 3 Iulii 2015. ↑ 10.0 10.1 Johnson, Richard (2006-11-09). "Page Six: Secure Location" . ↑ Saxon, Wolfgang. "Jacob Cohen, 74, Psychologist And Pioneer in Statistical Studies", The New York Times, 7 Februarii 1998. ↑ "Secure Location". Bowery Boogie . ↑ Seabrook, John (11 Iunii 2007). "Transplant". The New Yorker . ↑ "Secure Location". New York Post. 3 Decembris 2009 . ↑ Gray, Christopher (10 Novembris 1996). "For Rent: 3-Floor House, 9 1/2 Ft. Wide, $6,000 a Month". The New York Times . ↑ Bronson, Fred (2003). The Billboard Book of Number 1 Hits (5a ed.). United States: Billboard Books. p. 443. ISBN 9780823076772 . Chapin, Anna Alica. 1919. Greenwich Village. Propositum Gutenbergianum. Gold, Joyce. 1988. From Trout Stream to Bohemia: a walking guide to Greenwich Village history. Greenwich Village Society for Historic Preservation. 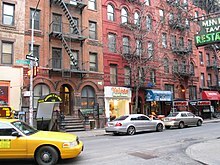 Greenwich Village Historic District. Tabula. New York City Landmarks Preservation Commission. Itineris dux vici "The Village." Lower East Side Preservation Initiative. Novissima mutatio die 26 Octobris 2016 hora 02:47 facta.